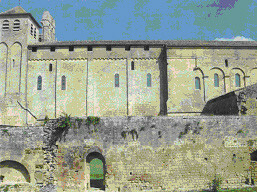 The Abbey of St Avit Sénieur has domes but not the domes that were originally intended. The existing domes are of considerable inventiveness and historical importance but are of a much later style. It seems clear that the Abbey was being restyled, renovated from a previous structure, into an Abbey in the style known as the Byzantine Romanesque, when something happened to prevent the completion of the work and halted the transformation. The Byzantine Romanesque, as its name suggests, is said to have come from the Byzantine Empire via St Marks in Venice. How and why is not entirely clear but, at the time, the Byzantine Empire was the richest and most cultured European society while the rest of Europe was still recovering from the devastations caused by centuries of raiding by the Vikings, Hungarians and Saracens. The style appears to have entered what we now call France, through the Narouze Gap between the Pyrenees and the Massif Central and spread into Aquitaine. It is particular to this region. The style has certain distinguishing features. The church is divided into a series of square bays. The sides of the bays have blind arcades, that is, a series of arches on columns against the wall. Above the top of the arcades are four arches on each side of the bay, supporting a ring of stonework and a dome. The space between the arches and the ring of stone is a curved triangle known as a pendentive. This seems to have originated in the Middle East where such a construction could more easily be made of brick. Much of the science and technology of the Middle Ages came from Arab sources and it also suggests the origin of the dome as the dome of heaven in both Muslim and Greek Orthodox religious buildings. There have been a number of theories about the original domes. That they were built and then destroyed to create a later style, which seems extravagant, disruptive and unnecessary. 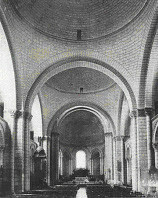 That the domes were being built when it was decided to adopt a later style although the style would not have appeared until long after the domes had been built. That the domes were never built. The most convincing theory is proposed by Pierre Dubourg-Noves in a paper presented to the 137th session of the Congres Archeologique de France in 1979 in which he points to evidence of a fire which, he suggests, destroyed the support for the domes and brought an end to their construction. 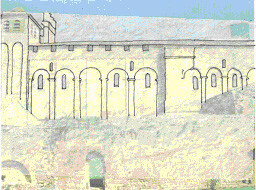 Section through the Abbey showing the position of the windows in relation to the bays. A fire would have destroyed the roof covering and scaffold support and disrupted the financial arrangements for the Abbey’s reconstruction. As the Abbey would have to rely, in part, on financial donations from pilgrimage, this could explain the delay in the resolution of the vaulting which is a considerable number of years later than the original proposed transformation. A fire is not difficult to understand given that the work would be carried out under a timber roof – there would be no point in constructing a masonry vault where rain could wash out the mortar in the stonework. The work would also require timber scaffolding. The only light might well be torches. I have no doubt that they would have taken considerable precautions but light would be naked flame however carefully protected. This is, of course, speculation, however convincing as Abbey was sacked in 1577 and its records destroyed. 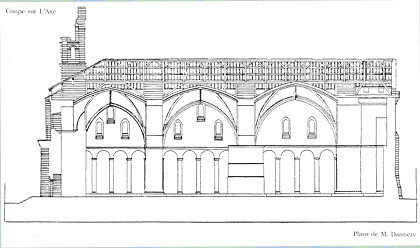 It does appear that the proposed Byzantine Romanesque was being introduced into an already existing Abbey. There are pilasters on the North and South facades and, as already mentioned, the position of the window openings bear little relation to them and only make sense on the exterior in relation to a proposed extension of the blind arcading. The pilasters suggest that the previous building had four bays to the ‘nave’ rather than the current two. The remains of St Avit himself were translated to the Abbey in 1117 – a date confirmed by a carved plaque in the church – which suggests that the campaign to alter the Abbey to the Byzantine Romanesque happened before this date. The Angevin dynasty, which gave its name to the current vaults, began in 1130 with the marriage of the daughter of the king of England to the Count of Anjou (Hence Angevin). 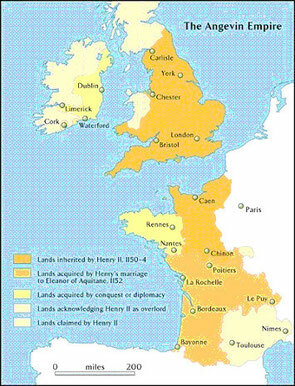 But Aquitaine only became part of this after Eleanor of Aquitaine married their son Henry and he acquired Aquitaine by this marriage. He became King of England in 1154 and Aquitaine became part of the Angevin empire which stretched from the Pyrenees to Scotland. 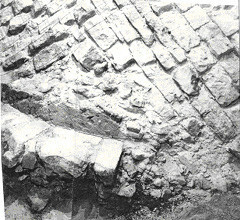 The vaults, then, are probably from the second half of the 12C. This suggests that, after the fire, if fire there was, the Abbey was roofed sufficiently to enable pilgrimage (and, therefore, donations) before the community could build the current vaults. But why should there be such activity in the 11C and, if there was a community of monks around St Avit, as I believe there was, should they suddenly become active in transforming the Abbey and moving the remains of the Saint? As the third year that followed the year one thousand drew near, there was to be seen over almost all the earth, but especially in Italy and Gaul, great renewal of church buildings; each Christian community driven by a spirit of rivalry to have a more glorious church than the others. It was as if the world had shaken itself, and, casting off its old garments, had dressed itself again in every part in a white robe of churches. It might seem that the Christian world was responding with relief to the passing of the Millennium, which many believed would bring the end of the world. This is partly true but the story is more complicated. At the end of the ninth century Europe had been fragmented into local communities as a result of devastating raids from three directions. 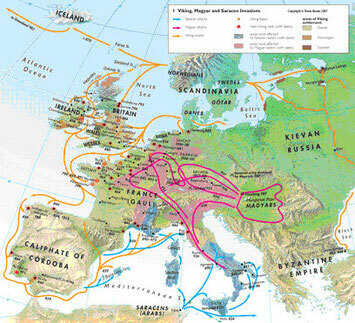 These were the Vikings from the North and West, the Hungarians from the East and the Saracens from North Africa. In the tenth century the Vikings were settled in Normandy in 911, in the case of France, and in 955 the Hungarians were subdued at the battle of Lechfeld. The Saracens appear to have been more pirate than invader. Europe was able to begin to recover and develop socially and technologically and there were inventions waiting to be exploited and a propitious climate. About 950 the climate entered a period called the little climate optimum which lasted until the13thC. This was coupled with developments in agriculture that enabled the exploitation of the warmer weather. The major developments were the invention of the three field rotation system which, by itself, increased yields by a third. 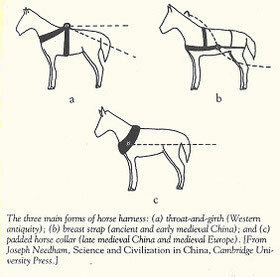 The invention of the horse collar and the use of metal horseshoes increased the amount of work that could be achieved in a day, because a horse can pull the same weight faster and longer than an ox, and this encouraged the development of new land, which was also possible as a result of climate change and was said to increase yields by 50%. And then there was the development of the heavy plough. The three field system also improved diet, as much for horses as for humans, as it encouraged the growing of oats, which is the food of choice for horses. 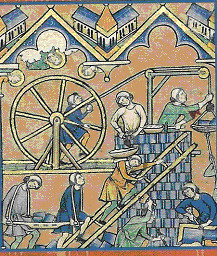 Alain Erlande-Brandenburg, in his book ‘The Cathedral Builders of the Middle Ages’, says ‘the appearance of the specialised stonecutters’ hammer...during the12C was a revolution. He also talks of ‘..the transition...made from rustic architecture, in which stone was shaped with hammers, to building with dressed stone, with small (i.e. thin) vertical and horizontal joints. It was a real revolution which took place at the beginning of the 11C in certain exceptional workshops’. Of a much later date than St Avit, an illustration showing the mason’s hammer, which appears to be chisel shaped in two directions. 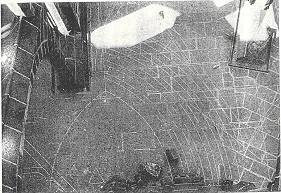 Note the single legged mason’s stool enabling the masons to move around while remaining seated. There is one final addition to this mix. That is the development of the cult of saints and of pilgrimage. It would seem that the monks were responding to a new energy and a sense of optimism. The domes the Abbey now has are not immediately apparent but domes they are, and they represent an extraordinary advance in medieval construction. The domes are groined domes, where the join of each part of the dome forms a kind of herringbone stitching above the ribs. The trick to the invention is the idea that one could support the ribs and then use this to carry timbers between the supports, on which stones could be laid vertically. The stones would interleave over the ribs and this would be hidden by them. 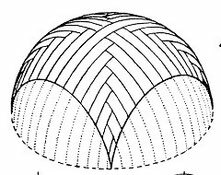 The domes are not made of decreasing rings of stone but are domes nonetheless dependant on the fact that they cannot collapse inward because of their shape. What is more, the domes could be laid from above like laying cobbles on a hill. The Abbey of St Avit Senieur might, then, be considered an unrecognised, but important, milestone in the development of Gothic Architecture. All of which, of course, had to be built using available technology and craft skills. The first necessity was someone to take responsibility to organise and coordinate the work. An architect or master mason. Stone had to be selected, cut to a preferred size, and transported along unmade up tracks on unsprung carts pulled, most probably, by oxen. It seems unlikely that any fine carving would be done in the quarry when there was a risk of stonework cracking or chipping on such a journey. The only exception might have been where stone could be transported by boat although this was obviously not possible at St Avit. Nonetheless there would be a balance to be struck to avoid transport of useless weight. Stone would be carefully cut in the quarry to the minimum size consistent with the risks associated with the transport. The work would also be easier to coordinate and control on site rather than at separate locations. On site, the stone would have to be cut and carved accurately to become part of the whole and the masons would have to know the profile and curvature of, for example, the ribs. 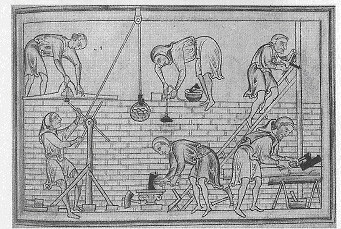 This was the job of the architect or master mason whose skill, apart from experience in the quality and characteristics of stone, lay in his knowledge of geometry and his skill with lines, arcs, circles, dividers, compasses and squares. Information was passed on and recorded visually using templates for the profile of a piece of stone and ‘drawings’ for the form in which they were to be assembled. There is evidence still, in some cathedrals, of the tracing floor on which they set out their designs, against which the workmen could check the accuracy of their work. It is probable that such a thing would have been used at St Avit – a flat area on which full sized shapes could be drawn i.e. incised in plaster or clay. This may have been in the cloister as the work in the Abbey would involve some clutter of stone, timber, rope and workmen engaged in construction. The cloister would be secure and at the centre of all the work. It could have been covered with a temporary roof. The work at St Avit is simpler than much later but had to be accurate. Stonework had to be hoisted into space and placed accurately. So the arc of the ribs had to be laid out, and was, using a simple geometry of known widths and heights, arcs of cord with a stylus to engrave two arcs to define the centre of a line. Rods to be placed at the intersections to determine a right angle to eventually fix the position of the centre of the radius of the arc. But there is one element of the design that deserves some particular attention. 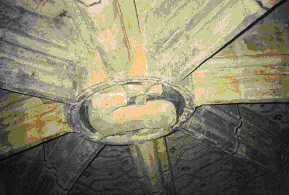 That is the boss of carved stone placed at the apex of the dome and of the ribs. Diagrams showing the setting out of pointed arches of the same height but of different widths using basic geometry. Once in place the boss will sit securely supported by the ribs, the weight compressing the ribs as a support in the same way that the keystone of an arch is supported by the arch, only in three dimensions. Raising and placing this stone must have involved some lifting devices that used knowledge of such things as gearing, block and tackle and counterbalance to raise such a considerable weight. What is more it would have to be raised to one side between the rib supports and moved horizontally into position and lowered onto the support for the ribs accurately. In his book ‘The Construction of Gothic Cathedrals’, John Fitchen shows a drawing of the raising of a keystone using a windlass supported in the roof structure. Such a lifting device at St Avit would involve the raising of the windlass, which could well weigh more than the keystone, and require its dismantling and a move for each of three keystones. This seems to be an uneconomical system at St Avit although it does expose some of the problems involved, particularly the placing of the keystone accurately at the junction of four ribs. It should be noted that St Avit has eight. 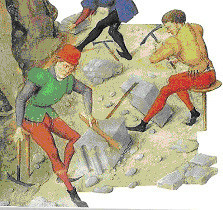 What is more, there is no provision for a working platform for the masons. 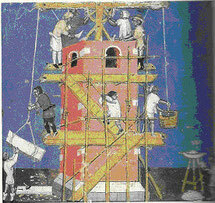 Two illustrations from ‘The Cathedral Builders of the Middle Ages’ appear to show, on the one hand, a crane that is counterweighted and placed at the top of a building and, on the other hand, a crane, also mounted at high level but where the power is provided by a treadmill at ground level. Both cranes would have to be dismantled and raised as the building rose or it might have been placed at a sufficient height that the building grew up to it. 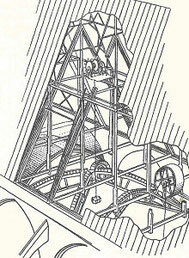 Neither option seems entirely convincing but the illustrations indicate that such mechanisms must have been in use. A counterweight system would not make sense if it was used only to raise the boss as one would have to raise the equivalent weight to act as a counter weight in the first place. 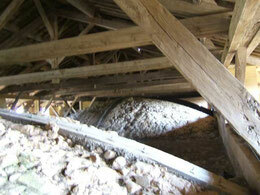 But it could be seen to make sense if it was in constant use to raise the stonework for the ribs and domes. The counterweight might also be useful in relieving the weight the boss as it was located. These are options and we cannot be certain of the methods used. They leave us with certain mysteries not quite explained but with a sense of admiration for evidence of ingenuity, invention and skill. I would like to acknowledge the generous help given by Jacques Capelle of the Friends of St Avit in arranging access to the Abbey at the time of its restoration and the introduction to the papers by Pierre Dubourg-Noves and Paul Fitte.